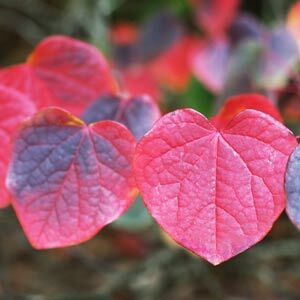 For brilliant autumn colour, it is hard to beat Disanthus cercidifolius. In the right position and climate it is one of the best, and most reliable small tree that will put on a brilliant display in autumn. If you live in a cooler area, a little shade and some moisture, perhaps similar to the Dandenong Ranges, Mt Macedon of some of the Highland areas in NSW then Disanthus cercidifolius really is a must for the garden. The round leafed Disanthus is really an outstanding performer, wonderful red foliage through the year, brilliant crimson in autumn and a really attractive arching habit. From the forests of Japan and China, Disanthus cercidifolius will reach around 3 – 4m in height. This is not a plant for hot sun, or poor soils, however in the right conditions it is one of the best for autumn color as well as attractive foliage and needing little to no care. You can prune back established specimens of this slow growing plant by .5m or so every few years ( 6-8) to add a little strength to the structure, particularly if the plant is getting a little ‘leggy’.